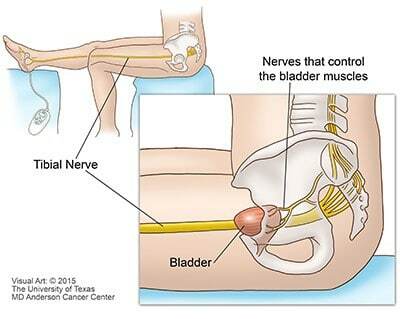 Percutaneous tibial nerve stimulation (PTNS) treatment is used to treat bladder overactivities including urinary frequency, urgency and urinary incontinence. Urinary incontinence is when a person loses the ability to control their urine resulting in leakage of urine. Urinary incontinence has many different causes and it can be distressing and can severely affect everyday life. Initial treatment for urinary incontinence usually includes fluid management, pelvic floor exercise, bladder retraining and medications. If conservative management is unsuccessful or the patient is reluctant to have an Intravesical Botox injection then PTNS may be advised. PTNS is a form of treatmentknown as “neuromodulator”. Bladder function is regulated by a group of nerves at the base of the spine called the sacral nerve plexus. By stimulating these nerves through gentle electrical impulses (neuromodulator), your bladder can be changed. A small, slim needle electrode (like an acupuncture needle) is temporarily inserted just above your ankle. The needle electrode is then connected to the battery-powered stimulator. The stimulator delivers a mild electric current along the needle into the tibial nerve. After turning on the stimulator, the clinician observes the response to determine the ideal strength of the impulses. Each of the treatment sessions will last approximately 40 minutes. The treatment consists of an initial series of 12 treatments, typically scheduled a week apart. After the initial 12 treatments, your clinician will discuss you response to the treatment and determine if you will need future treatments to maintain your results. It’s difficult to say as people respond in different ways, but most patients feel a buzzing, tingling or throbbing sensation while the stimulation is occurring. Once the correct feeling is located the current can be turned down so that it is comfortable – it is not necessary to feel this throbbing sensation for the whole 30 minutes. It usually takes betweensix and ten treatments before any change in symptoms is apparent. It is very important that there is no gap in the twelve week treatment programme as this can affect the success of the treatment. Most patients have to return for booster treatment as the effects of PTNS start to wear off after four – sixmonths. As it is a relatively new treatment it is not known how effective it is in the long term. PTNS is a very safe procedure. Individuals with nerve damage that could impact either percutaneous tibial nerve or pelvic floor function. Women who are pregnant or planning to become pregnant during the duration of the treatment. There are currently no recorded serious side effects. This is a minimally invasive treatment which improves the symptoms of urinary leakage and urgency in up to 82% of the patients who have it. The other method of neuromodulator is to surgically implant a stimulator in the buttocks which sends continuous impulses to the sacral nerve plexus. This involves surgery and having a permanent implant in the body and so involves more risks and side effects. How the treatment is done? You will remain comfortably seated for the 30 minutes treatment. Let you clinician know if the sensation is too strong or if your sitting position is uncomfortable. You will be asked to go and use the toilet prior to the treatment as you will not be able to go to the toilet during the treatment. You can read, or do crossword puzzles or other similar activates during you treatment. Once the treatment has started you would not be able to move around or move the leg than the PTNS machine is attached too. The stimulator will beep upon the completion of the treatment session. You clinician or nurse will turn off the stimulator and remove the needle electrode. You should be able to resume normal activities immediately following treatment. You will have an initial series of 12 weekly sessions lasting for approximately 30 minutes each. Your first appointment (assessment and treatment) will be an hour after that your appointments will take about 45 minutes. As this is relatively new treatment it is important to collect as much information about your problem both before and after the treatment. You will be asked to fill in assessments about you symptoms and the affects they have on your life. It is important you complete all the assessment forms given or sent to you and bring to your appointment us assess, address, treat and review your symptoms. You should report any side affects you experience. This is important as it is a new treatment. You may need to return periodically to maintain you improved continence for further treatments (this is usually every 4-6 months). It is very important to the success of the treatment that there are no long breaks during the initial 12 weeks of treatment. If you have a holiday planned it is best to delay the start of treatment until after the holiday. If you have any further question, please do not hesitate to ask.